It’s been a long time since my kitchen’s been put to good use. 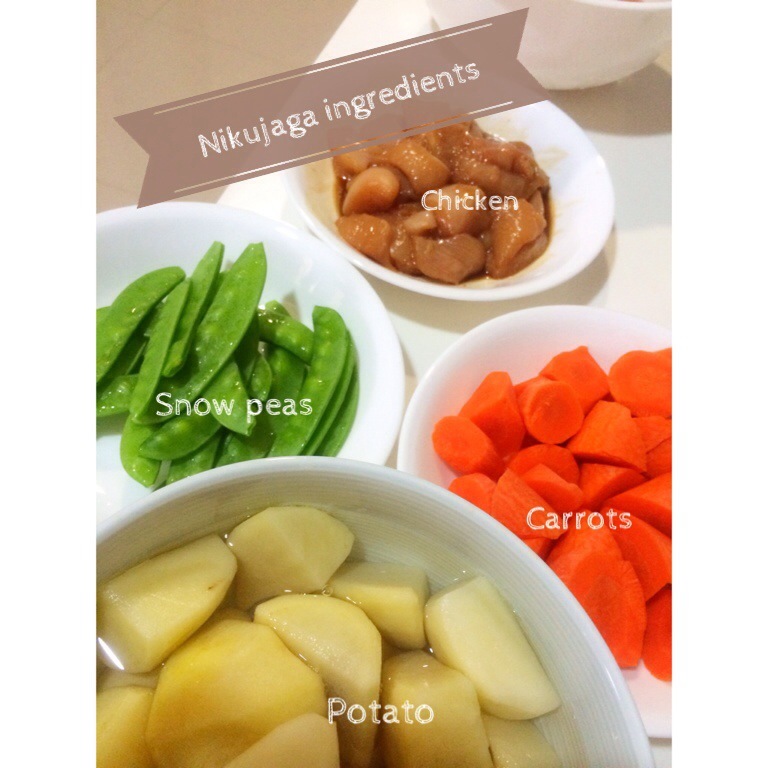 Decided to make a one dish meal tonight and nikujaga it is. 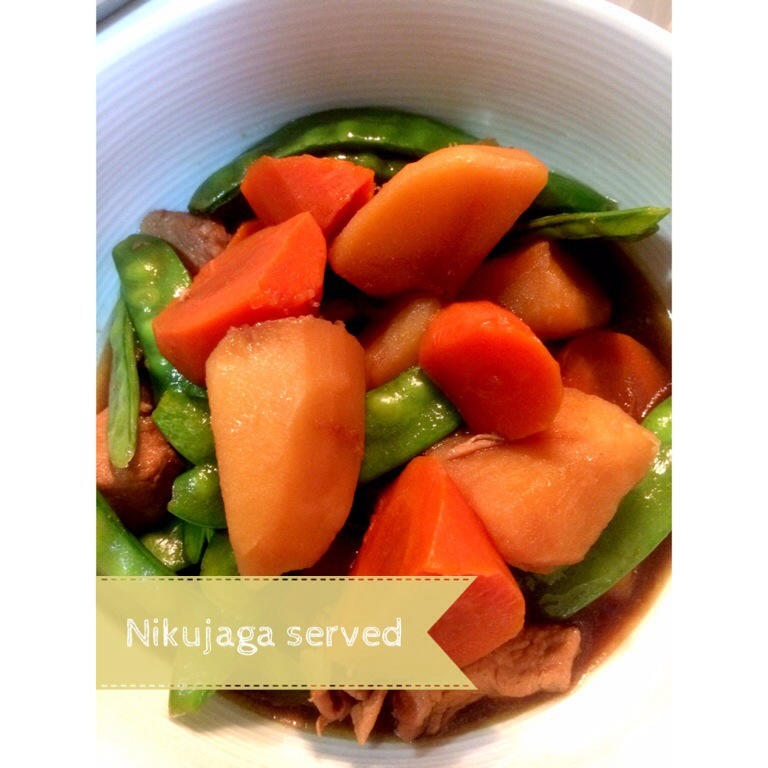 Nikujaga is a common Japanese family dish made up of meat and potatoes. It is slightly sweet and savory and is a very hearty dish, eaten with or without rice. 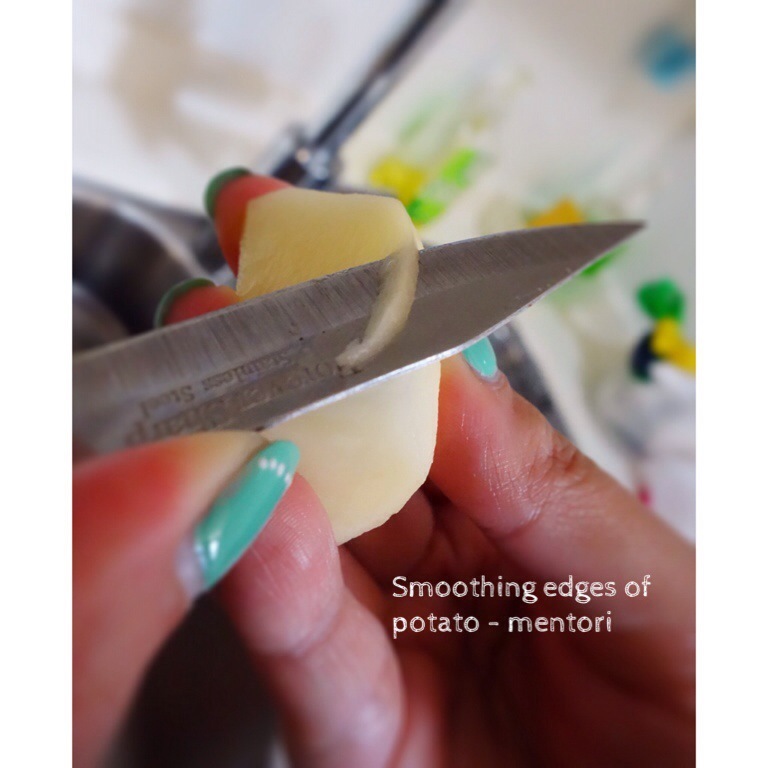 Note for carrots and potatoes, smooth the sharp edges before cooking (Japanese cutting technique called mentori) to prevent breaking up while stirring. Pork, beef or chicken can be used for this dish. I chose chicken breast (200g) lightly marinated with soy sauce, 2 carrots and 3 potatoes. Snow peas (1/2 pack) were added just before serving as they did not need much time to cook. I used about 10g instant powdered dashi (unsalted) mixed with 1 cup water. 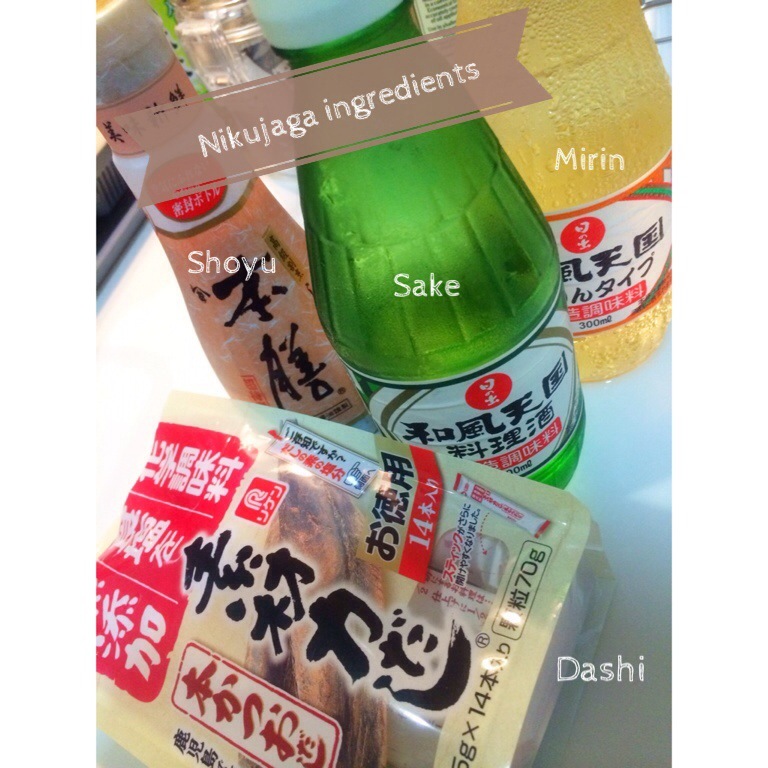 4 tablespoons of mirin, 2 tablespoons of cooking sake and 4 tablespoons of soy sauce. For those who like their food sweeter, sugar maybe added. More water can be added as desired to ensure all ingredients are covered. As I did not have onions, used 3 slices of ginger instead. The taste was altered somewhat but still tasted good. In 1 tablespoon of oil in a pot, fry the ginger till fragrant. Add in chicken, cook for 2 minutes, then add potatoes and carrots. Leave to cook for another few minutes, add the dashi stock and the rest of the sauces. 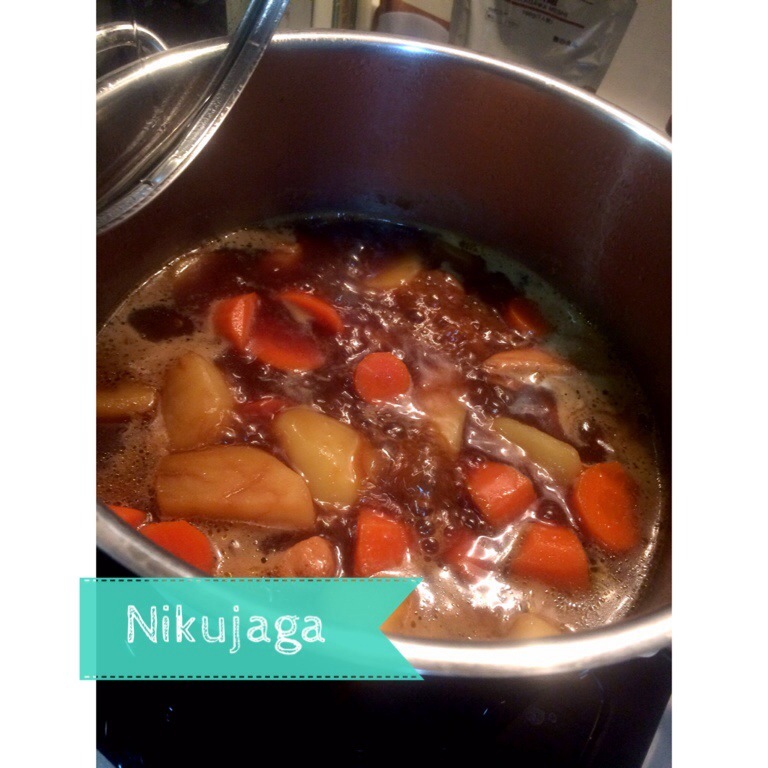 Simmer for 20min or till potatoes and carrots soften. Before serving, put in the snow peas to cook for about 4 min and serve. Also made some ajitsuke tamago (marinated soft boiled egg) as a side dish.